Grab this heated massager for only $22.25 after 50% OFF code from the gleam at bottom of this post! 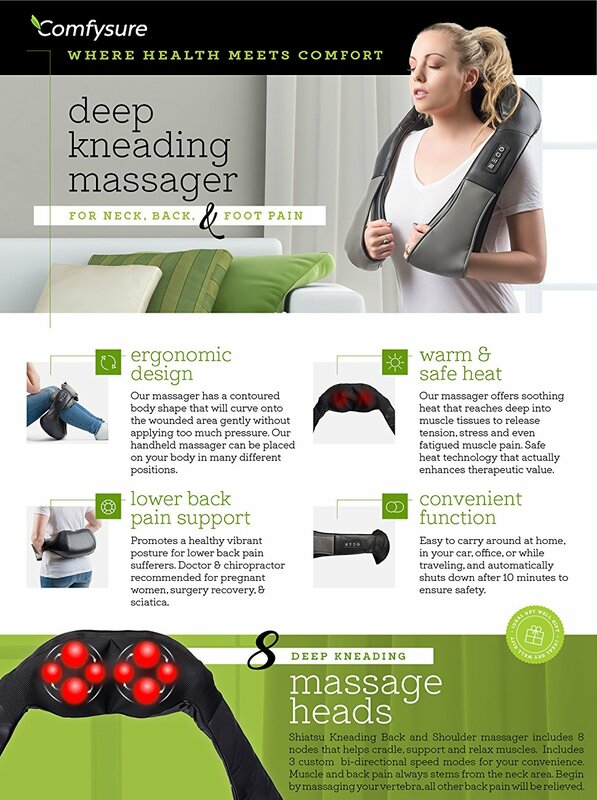 8 DEEP KNEADING MASSAGE HEADS: Shiatsu Kneading Back and Shoulder massager with heat includes 8 nodes that helps cradle, support and relax muscles. Bi-directional custom 3 speed modes available. RELIEVES CERVICAL & BACK PAIN: Relieves multiple problems such as slipped discs, sciatica & arthritis. For intense neck, shoulder, upper or lower back, waist, body, arms, legs & foot pain.CERVICAL & BACK PAIN: For multiple back problems such as slipped discs, sciatica & arthritis. For intense neck, shoulder, upper or lower back, waist, body, arms, legs & foot Pain. WARM & SAFE HEAT: Offering a soothing heat that reaches deep into muscle tissues to release tension, stress and even fatigued muscle pain. Safe heat technology that’s actually enhances therapeutic value. One turn on/off button safe function. Automatically shuts down after 10 minutes working. Not recommended to use for more than 20 min. ERGONOMIC DESIGN: Contoured body shape that will curve onto the wounded area gently without applying too much pressure. All muscle and back pain begin in the neck area, by massaging your vertebra, all other back pain will be relieved. Our handheld massager may be transferred to many positions on your body, just be creative. PORTABLE FEATURE: Easy to carry around at home, car, office or while traveling. Both a 6.6’ AC adapter 110-220V to 12V DC and a bonus 5' car adapter are included (UL Listed). 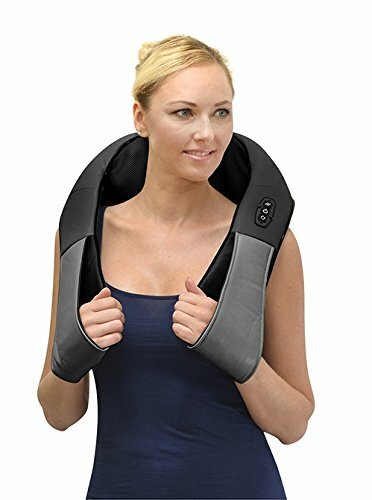 shiatsu neck & back massager with heat adds heat and intensity to those hard-to-reach deep muscle groups that help reduce tightness and improve overall flexibility. Precision shoulder and neck support that hits right on the base of the spine all the way up to the center of the back. Our high quality kneading massager with heat which molds into an ergonomic streamlining, using bi-directional movement that mimics the feeling of a personal massage. 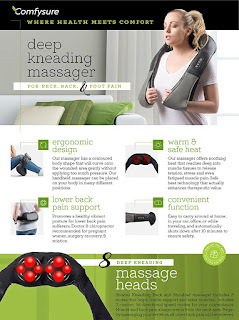 It has 8 kneading rollers that rotate to create the maximum amount of Shiatsu pressure. These nodes help cradle, support and relax muscles. Not too firm but reaches deep into muscle tissues. One turn on/off button safe function. Automatically shuts down after 10 minutes working. Not recommended to use for more than 20 min. ComfySure shiatsu upper back and shoulder massager with heat is edged with an ergonomic hand loop on both sides, to avoid hurting your hands while the machine is in motion. Promotes a healthy vibrant posture for lower back pain sufferers. Doctors & chiropractor recommended orthopedic lumbar cushion for pregnant women, surgery recovery, piriformis, coccyx, sciatica, numbness on the back, lumbosacral spondylitis, & fibromyalgia. Dimensions: 50" diameter by 7”. Can be fold into 16.5” for travel and storing use. 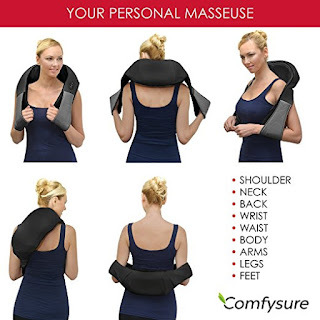 ComfySure handheld shiatsu massages is an awesome idea for business gift, office gifts, holiday gift, senior gift & back surgery recovery gift.